Developmental biologists have long been picturing development as a process starting from a homogeneous population which becomes more and more different and eventually gives rise to a variety of terminally differentiated cell types. Waddington envisioned that this process governed by an “epigenetic landscape” is defined by genes and their interactions. Some key genes in the specification processes have been discovered since then, but the major regulators for most of the states in developmental processes remain uncharted to date. The advent of massively parallel profiling techniques for single cells allows capturing a snapshot of a huge number of cell states simultaneously. When capturing cells from different stages, the similarity between the cells can be utilized to determine cell types and to reconstruct the developmental paths leading to each type. Single cell profiling techniques have helped in the discovery of otherwise unannotated cell types and genes that might tune how a cell commits to a particular fate. However, because the techniques only capture snapshots of different states but not how they change in time, it’s challenging to determine whether each cell decides their goal early on and progresses along that particular branch to become a certain type, or if the cells remain plastic and carry the potential to switch trajectories along the way before becoming terminally differentiated. As a result, the reconstructed developmental paths need to be validated by experiments like lineage tracing to understand the degree of coupling between an early state and a terminally differentiated state. Lineage tracing experiments are often of lower throughput and require a specific early marker. One way to address this challenge is to label developing cells with unique barcodes that are heritable through cell divisions, and infer later whether two cell types come from the same progenitor pool by calculating the degree of barcode overlap between the two mature cell types. In this preprint, Weinreb et al. first barcoded murine hematopoietic progenitor cells using lentivirus. Then, the cells were cultured in a condition enabling multilineage differentiation and were allowed to proliferate for two days. The cells were collected on day 2, day 4, and day 6 of in vitro differentiation. 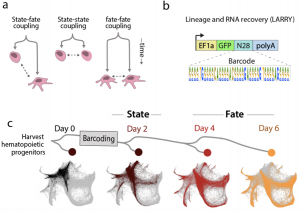 By matching barcodes, this technique gives transcriptome and clonal information for multiple stages of differentiation. Collecting clonal and transcriptome information allowed the authors to examine two important questions: Whether the differentiating cells are really progressing through a branching process, in which one cell cannot contribute to alternative fates once it has passed the branching point, and whether the time of branching event can be determined from the transcriptome alone (See figure 1). Figure 1. Lineage-traced single cell RNA-seq helps estimate the relationships between transcriptionally defined cell states (Adapted from figure 1 of the preprint, under a CC-BY-NC-ND 4.0 International license). The authors first demonstrated that the cells of a particular transcriptionally defined type share most of their barcodes, indicating that transcriptionally determined cell types arose from different populations of progenitors. Then, the authors compared if transcriptomes of differentiated sister cells (“lateral prediction”) predict a cell’s fate better than the transcriptomes of progenitor sister cells (“forward prediction”), and discovered predictions from differentiated sister cells are more accurate. This difference in prediction power before and after differentiation could either be a result of the noisy nature of single cell RNA-seq which masks minor transcriptional differences, or it suggests that cellular properties other than the transcriptome also modulate cell fate decision. To understand the exact point when a cell’s fate is specified, the authors used several computational methods to predict the time of diversification events, and compared the predicted time points to the point when different clones no longer contribute to the alternative fate. It turned out a cell’s ability to commit to other paths is restricted much earlier than what was predicted computationally based on the transcriptome alone. Taken together, by combining clonal and transcriptome information, the authors showed that transcriptionally defined cell types in hematopoiesis are also clonally distinct. Furthermore, they showed that changes in the transcriptome correlate well with developmental time, and that fate restriction precedes overall transcriptomic discretion in development and might be better predicted by examining master cell fate regulators alone. The high-throughput nature of single cell profiling techniques enables researchers to study cells with different states with a high resolution. Nonetheless, it is challenging to understand how these states are related to each other because the profiling technique is essentially snapshot taking and provides no information about relationships. Multiple assumptions are required in developmental biology to learn the continuous process of development from single cell profiling. Two common assumptions are that the differentiation process is a branching and definite process, and that similarity in transcriptomes can be interpreted as temporal proximity. This preprint focuses on these key questions and benchmarks them experimentally. Although the necessity to separate sister cells limits the use of this technique, when applicable, it could be used to better capture development as a continuous process. In a previous study , the authors utilized an elegant clonal tagging by an inducible transposable element in a mouse model, while lentiviral transduction was used in the preprint. I was wondering what the considerations behind the different methods chosen. The authors devised an elegant and user-friendly visualization tool for single cell profiling data , and in this preprint, the authors used SPRING plot to visualize multimodal (expression and clonal identity) data. I was wondering if it would be a plan to add this functionality to the tool, for it would be a great asset to the community. Weinreb, C., Wolock, S. & Klein, A. M. SPRING: A kinetic interface for visualizing high dimensional single-cell expression data. Bioinformatics 34, 1246–1248 (2018). Q1: How to barcode? Inducible transposable elements or lentiviral transduction? The transposable elements are fantastic for non-perturbative barcoding in vivo. Their limitation is that they don’t create a barcode expressed in mRNA. So they can’t be read out by single cell RNA-Seq. The lentiviral approach has the big disadvantage of requiring a massive perturbation (namely isolating the cells and infecting them in vitro), but it allows reading out a barcode by scRNA-Seq. 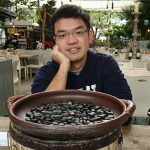 Q2: Thanks for the great suggestion to visualize clonal data using SPRING! We don’t yet have an “all in one” package that goes from raw clonal data to completed analyses on SPRING yet. It’s a great idea.